Many in the congregation objected to the "vaudeville theatre seats" in the new building, which only stood for fifteen years. In this photo circa 1894, the "Welcome GAR" banner announces a celebration of the Grand Army of the Republic, an influential society of Civil War veterans. SEATTLE – First United Methodist Church, the first and longest-existing church in Seattle, celebrates its 162nd anniversary on Sunday, Dec. 6 at 10:30 a.m. A featured event of the day will be the unveiling of a timeline spanning 160 years, “The History of First United Methodist Church,” on a 40-foot stretch of wall on the main sanctuary level. Founded in 1853, just two years after the founding of Seattle, First Church has shared the vicissitudes of this city’s fortunes. Bullet holes from an early Native American raid, the 1856 “Battle of Seattle,” remained in the siding of the 1854 church parsonage built by the founding pastor, Rev. David Blaine. That structure was torn down around 1900 to make room for an Opera House at Second and Cherry. First Church’s Gothic-Revival style cathedral at Third and Marion, built in 1889, survived the Great Seattle Fire, but lasted only fifteen years afterward due to the Third Avenue regrade of 1906 and a growing downtown financial district. The congregation worshipped for most of the 20th century at the corner of Fifth and Marion, and up until its 2010 move to 180 Denny Way. “Denny Way seems like an appropriate address for us now, given that Arthur and Mary Denny were founding members of our church,” says Gebben. Duwamish Chief Seattle’s daughter “Kick-Is,” known to early Seattleites as Princess Angeline, was at one time employed in the First Church parsonage kitchen. 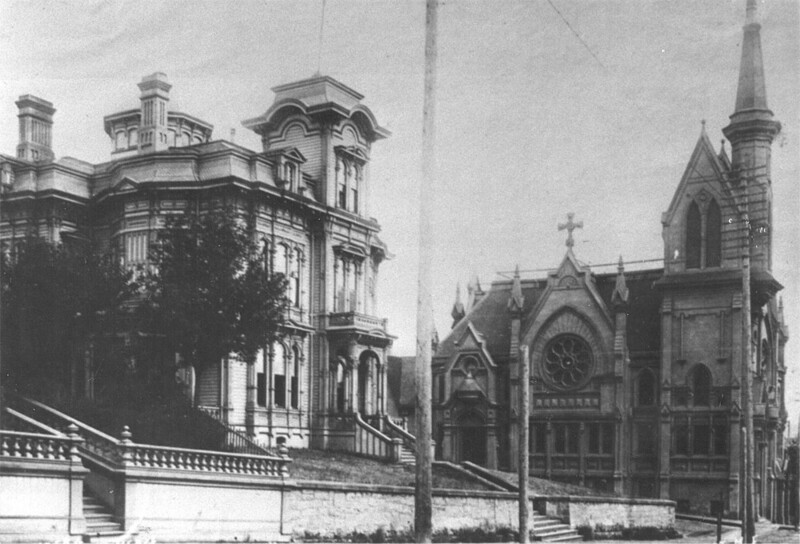 In September, 1889, two months after the great Seattle fire, First Church opened the doors of its new, Gothic Revival-style church at the corner of Third and Marion, erected in the same year Washington achieved statehood. In the foreground is the Seattle Chamber of Commerce. The timeline holds up some of these stories. Back in the 1880s, when the Chinese immigrant population increased due the labor needs of building the railroad, the First Church congregation held a school for Chinese immigrant families in their church. As a result, during an anti-Chinese riot in Seattle in 1885, a mob came to the church and threatened to burn down. The pastor Rev. John Denison stood guard with two others to protect the building for several days, until the Home Guard came from Portland to restore order. In the 1940s, First Church trustees assumed the deed of the Japanese Methodist Church while Japanese Americans endured evacuation to internment camps, so they’d have a church to come home to. Over the years, Seattle and First Church have had boom and bust years. During the Klondike Gold Rush, First Church member T.S. Lippy staked a claim on Forty Mile Creek in Alaska and struck gold, thereby earning the nickname “El Dorado King.” His new wealth helped support the church’s 1908 building at Fifth and Marion, and also build Seattle’s General Hospital across Marion from the church on Fifth Avenue. During the post-war years in the 1950s, weddings took place at First Church on an average of one a day. Stories of the tough times appear on the timeline as well. A 1920 Western Union Telegram is displayed telling of dire straits and the need for financial assistance sent during the Seattle General Strike of that year. When Boeing made cutbacks in the late 1960s and early 1970s, First Church leaders hired laid-off Boeing workers to remodel the fellowship hall. The longstanding story of First Church outreach to those in need expands into the present with the Blaine Center homeless shelter for sixty men now on the property, and weekly Shared Breakfasts for the homeless on Sundays. “With the timeline, we’re remembering our history to build on its most faithful aspects, the ways we’ve participated to this day in establishing a more life-giving future for our community and world,” says Rev. Moe. On Sunday, December 6, images and stories that have long been gathering dust in the archives will become visible for all to enjoy. All are welcome to attend the worship service and timeline unveiling starting at 10:30 a.m. on Sunday December 6. A fellowship reception with treats and coffee follows the service. Previous articleWhy Camp? Camp is a vehicle for developing leaders!